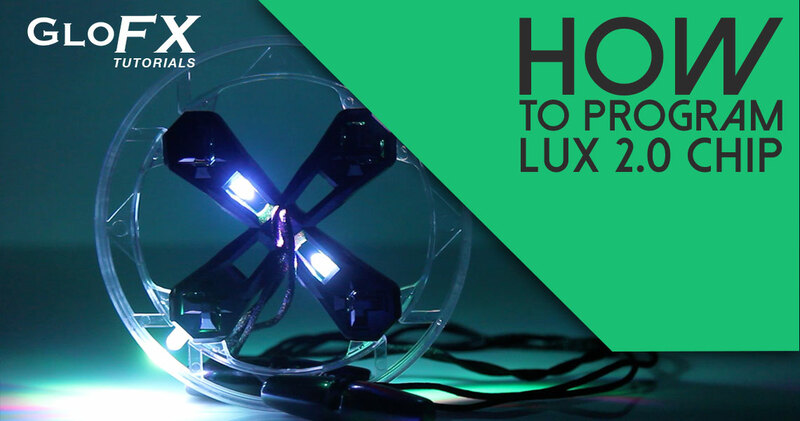 The GloFX Product Development Team spent over a year and countless hours developing the Lux 360 2.0 Orbit. The Lux 360 2.0 Orbit combines LED lights with luxury. Lux means “a unit of illumination or light” in Latin, and the name of this product truly captures its essence. Lux is aimed at light show aficionados and flow art enthusiasts who crave the newest and most elite products. The Lux 360 Orbit is housed within a virtually indestructible Polycarbonate (PC) shell. PC is the hardest material available, better than ABS or other commonly used plastics. This is the same materials used in riot shields to protect the lives of police officers. PC is also lightweight for faster spinning. The 360 Orbit Housing is an insanely advanced piece of technology designed to take the orbit to the next level. The black shell hides inner mid-section light to produce even rings and crisp light trails. The 360 Housing lets the user choose the LED position inward or outward. Thus producing: A) Outer ring only, B) Inner ring only, or C) The infamous Dual-Orbit ring! The inner casing is solid black creating the most crisp Dual-Orbit light trails, while the outer ring is 100% clear allowing all light to pass through. The Housing also features Pro-Click Buttons for easy mode changing and color selection on each of the four LEDs. The most advanced feature of our 360 Housing is the outer ring. This ring is designed to never let the orbit stop spinning. Who cares if your orbit bounces off a table, wall, or you. Off-body bounces and flares are enhanced with the contoured design. Perform tricks you never could before by letting the orbit bounce off your arm, shoulder, and legs. Flowing has never been so smooth. The seamless outer ring prevents the orbit from ever stopping. It also protects your LED’s – no more shattering LED bulbs when your orbit hits a hard object. The 360 Orbit cannot tangle in your strings and is the best orbit for beginners and professionals. Powered by a custom microchip that features onboard memory only found in Lux Series products, this is the most advanced chip that our engineers have ever developed. The Lux Chip allows the user to select their own custom color scheme from over 1,000,000 color combinations and variations. Select your favorite colors and enjoy nine versatile mode patterns. Or, find your perfect mode and convert your chip to one mode only. The onboard memory allows the LEDs found in the orbit to “save” your favorite color pattern without fear of it being lost…even if the batteries are removed! Immediately return to your favorite setting with only one click. We’ve created an LED that emits incredible amounts of light, but still lasts. On any mode running non-stop, our LED’s remain lit for over ten hours! We didn’t stop with the housing – this orbit also features the X-Clip and Pro-Click Button. Our “X” shaped battery clip is designed for insanely fast battery changes and guaranteed to hold your batteries tightly in place. Pro-Click Buttons are easy to press while in motion for lightning fast mode changes. Rest assured, we thought of everything when designing this housing. When practicing, we recommend switching all four LEDs to Mode-5 in the chip’s color setting to Red-Red-Red. This mode will put your Lux Microchips into low battery consumption that can last up to 20 hours of continued use! The best orbit in the world also needs to spin perfectly…so we carefully balanced our orbit for flawless tricks. We added a thicker 2 mm satin string paired with the GloFX T2 Handles. Our handles feature the ability to produce maximum tension and pull-strength in your orbit. They also let the user perform insane tricks while maintaining absolute control of the Lux 360 Orbit. Better yet, the handle is ergonomically shaped to fit in under your fingers, behind your hand, or in your fist. The slim design let’s the user wrap the orbit string while maintaining a firm grip. Best of all, the T2 Handle can be removed from the Lux 360 Orbit in under 5 seconds. I would absolutely reccomend the lux orbit. My girlfriend bought me this orbit for bday and its really heavy. Once you get used to the weight, it’s actually better than other orbits becuase it stays spinning longer and has more flow. After using it for a week or two I am used to it. colors are great. bright lights. good batteries and came in a cool box. I am in love with lux! touche GloFX. touche. I was not sure what to expect with this…being GloFx’s first true custom orbit. But I am thoroughly impressed. dope modes, super bright, and very high quality feeling. I will be back. Awesome company. Been buying their orbits for years and this one blows the others out of the water. Thank you for taking the time to take orbiting to the next level and caring for your customers!! So bright you need sunglasses. Absolutely fascinated with the color options. The colors sound like fruit candy lol. box was damaged when I got it, but it still worked fine. damn post office!!! Go with the Ion the lux isn’t the best orbit out there it needs 4 holes for the strings that would make it spin a lot better.